This article discusses RE101 and RE102, including the updates contained in MIL-STD-461 revision “G”, the current version. These tests quantify undesired signals being radiated into the air from a device and the associated cables. If unchecked, these signals couple onto other equipment cables or may enter into the other equipment chassis and onto internal conductors. The received field has the potential to induce current in other equipment conductors and may cause harmful interference from either field. Both of these test methods have been a part of the MIL-STD-461 test program from the onset using RE04 (Magnetic Field) and RE02 (Electric Field) numbering. The release of MIL-STD-461C changed the RE04 number to RE01 for the magnetic field radiation test method but MIL-STD-462 continued to refer to RE04 even with issued notices updating the standard. RE01 (RE04) covered the frequency range of 30 Hz to 50 kHz with the magnetic loop antenna located 1-meter from the Equipment Under Test (EUT). The limit was in dBpT (dB referenced to 1 picotesla) terms indicating a flux density measurement. RE02 covered the frequency range of 14 kHz to 10 GHz for narrowband (NB) emissions and limited the upper frequency to 1 GHz for broadband (BB) emissions with the antenna located 1-meter from the EUT. The limit was in dBμV/m for NB emissions and dBμV/m/MHz for BB emissions. As noted above, RE02 called for tests to determine if the emissions were classified as narrowband (NB) or broadband (BB). 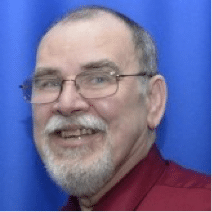 The limits would allow broadband emissions to be higher in amplitude since this kind of noise tended to have a more benign impact to human senses. Compare the sound of wind blowing through trees creating many sound frequencies (BB) to a siren with a single frequency (NB). The wind would permit audio speech and the siren would provide a greater interference to speech reception. In the early days, interference to radio communications was a dominant problem so the separation of NB and BB had a significant impact on product qualification. Adjust the frequency ±2 IBW (IBWNote 1 is impulsive bandwidth part of the receiver calibration). Note 1: IBW is a measure of how the receiver reacts to an impulse signal. An impulse generator (IG) signal with the impulse peak calibrated for a 1 MHz bandwidth is applied to the receiver. If the receiver bandwidth is set for 10 kHz, the impulse should measure 40 dB lower than the IG amplitude setting. Assume that the IG output is set for 80 dBμV/MHz and the receiver measurement is 42 dBμV for a 38 dB impulse restriction indicating an IBW of 12.6 kHz. Calibration of the IBW is only necessary if measuring BB signals and converting to the /MHz units. If either of these two tests resulted in a BB classification, the emission was BB and was compared to the limit to determine acceptance. Let’s not forget that the limit measurement units for BB are dBμA/MHz, so the measurement had to be normalized to the /MHz units by applying a -20logBW in MHz conversion factor. For example, if your measurement was using a 10 kHz bandwidth (BW), then -20log(0.01) would provide a 40 dB conversion to conform the measurement to dBμA/MHz units. Note 1 above provides more detail on the conversion. For a quick assessment, tune the receiver to the emission frequency and change the receiver BW by a factor of ten. If the measurement did not change the emission is NB, if the measurement changed by 10 dB the emission is random noise and if the measurement changed by 20 dB the emission is BB. Note that this technique doesn’t follow the standard, so for official measurements use the standard approach. In 1993 the release of MIL-STD-461D and MIL-STD-462D changed the testing to RE101 for the 30 Hz to 100 kHz frequency range measured with a 13.3 cm loop sensor located 7 cm and 50 cm from the EUT. The two distances were specified to determine if the magnetic field attenuation would allow the item to be accepted for use if the 7 cm test showed non-compliance and the application did not jeopardize other equipment in the vicinity. RE102, the electric field test method, changed the frequency range to 10 kHz to 18 GHz (actually 1 GHz or 10-times the highest intentionally generated frequency up to 18 GHz) and called out particular antennae for various frequency ranges. This revision also deleted the NB / BB determination requirement and prescribed specific BWs for selected test frequency ranges. This version required that cables were exposed during test, so cable radiation could be measured during the radiated portion of the test program. MIL-STD-461D specified that an anechoic test chamber be used for RE102 testing to reduce the effect of reverberation causing very large measurement errors. The anechoic room required that the RF absorber minimum absorption be 6 dB (80 MHz – 250 MHz) and 10 dB (above 250 MHz). MIL-STD-461E removed the 50 cm testing distance calling for compliance at the 7 cm test distance. This took away having measurements at another distance making the decision to grant a waiver more difficult. I want to expand on this a bit because reducing magnetic field emissions can be challenging. Let’s consider a laptop computer where the current associated with a bright screen produces an over limit at 7 cm. Moving the receiving loop to a distance of 15 cm reduces the field below the limit with the 15 cm distance from the front or rear of the display. If the laptop is used on a desk, it is unlikely that a susceptible device will be located within the 15 cm distance especially the front where the operator will be located during operation. If by some remote chance, the rear causes an issue, placing a ferrous metal sheet between the laptop and the susceptible device should redirect the flux lines and resolve the problem. MIL-STD-461F added a distance measurement to the RE101 test method. If the device was non-compliant at the 7 cm distance, the procedure calls for increasing the distance to meet the limit and provide that distance information in the test report for assessment by the procuring agency. RE102 implemented a significant change in positioning and configuring the rod antenna for measurements below 30 MHz. The standard of connecting the base counterpoise to the ground plane was deleted. The rod antenna base also connected the cable connector to the base instead of using an isolated coaxial connector. A ferrite was installed on the cable to the receiver. 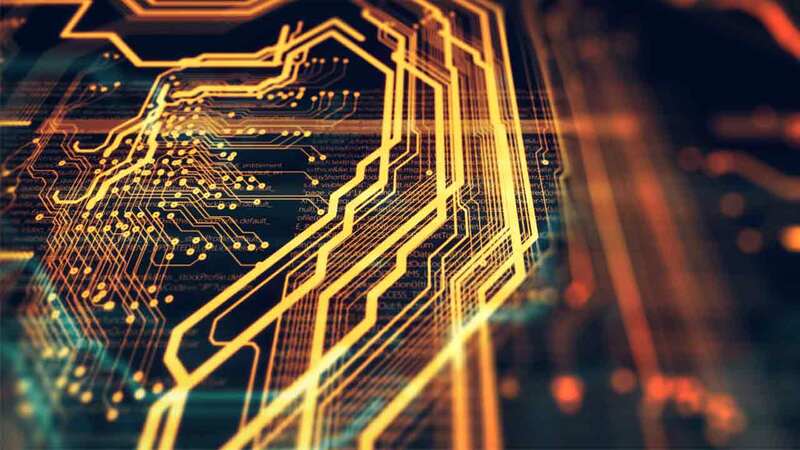 The changes brought about a lot of concern from the EMC community, but several studies demonstrated that the MIL-STD-461F configuration obtained more consistent results from one facility to another. MIL-STD-461G brought forth a few minor changes to the RE101 test method. RE102 also had minor changes but one that is significant. The test frequency range 10 kHz to 18 GHz, eliminating the option to end the test at 1 GHz or 10-times the highest intentionally generated frequency up to 18 GHz. 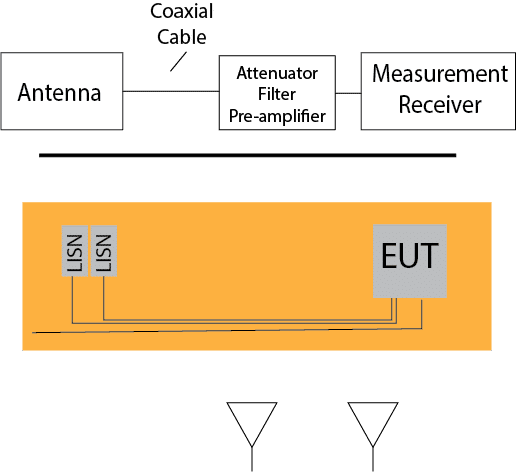 This can be a significant impact in test time for large devices where the antenna beam-width demands multiple antenna positions in the 1-18 GHz frequency range, especially when using a tuning receiver (time is low when using an FFT receiver because you can measure 100 MHz or more at the same dwell time instead of ½ bandwidth per dwell time interval). Our discussion on the detailed requirements is based on MIL-STD-461G, the current standard. Let’s delve into RE101 first with the signal integrity verification where we check the measurement system by creating a known signal frequency and amplitude. We then measure the signal to ensure we obtain the correct values using the measurement system we have selected for test. Adding to the check, the target amplitude should be 6 dB below the applicable limit to demonstrate measurement system sensitivity to detect emissions at that level. Assemble the signal source for measurement as shown in Figure 1 part A using the coaxial cable selected for EUT testing. Set the signal generator frequency to 50 kHz and amplitude to the limit minus 6 dB minus the loop conversion factor. The loop is not present for this signal check, but the measurement system will include the factor as part of the data reduction. Operate the measurement receiver to capture the 50 kHz signal and verify that the measurement is 6 dB below the limit (±3 dB). Assuming the signal check was correct, connect an ohmmeter to the loop antenna coaxial connector center pin and body (Figure 1, part B). Verify that the resistance is between 5 and 10 ohms. This confirms that the internal wiring is not shorted or open. It is a good idea to have a record of your loop’s resistance, so the resistance check can be a bit more accurate and minor changes can be detected. Now we can configure the test item as shown in Figure 2 for testing after successful completion of the signal integrity check. The loop antenna is placed 7 cm from the EUT with the loop parallel to the EUT and perpendicular to the ground plane. Move the loop antenna into position after the EUT is operating and stabilized to avoid capture of inrush current effects. Set the receiver to capture a segment of the test frequency range, normally the range for one of the bandwidth settings. Set the receiver to max hold to capture worst-case emissions. While observing the receiver display, move the loop antenna over the EUT face maintaining the 7 cm spacing. At the location where the worst-case emissions were detected, orient the loop to perpendicular to the EUT and perpendicular to the ground plane to verify maximum emissions. The third orientation, perpendicular to the EUT and parallel to the ground plane will be used to complete that segment of the test. Repeat the testing for each frequency range segment and each face of the EUT. 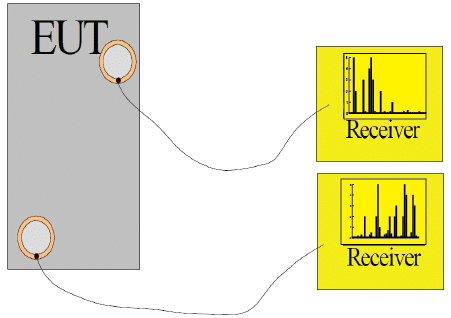 The standard discusses measuring worst-case emission and a number of frequency points, but this method described above captures all frequency points instead of a select few. It is common on large test items to discover that different antenna locations show different emissions as indicated in Figure 3. In a case like this each point would need to be captured separately. If the results show over-limit emission, measure the distance from the EUT where the limit is met to support review by the procuring agency as we discussed earlier. We begin the RE102 procedure with the system integrity verification. Recall that revision “G” permitted removing several passive test equipment items from periodic calibration including passive antennas. 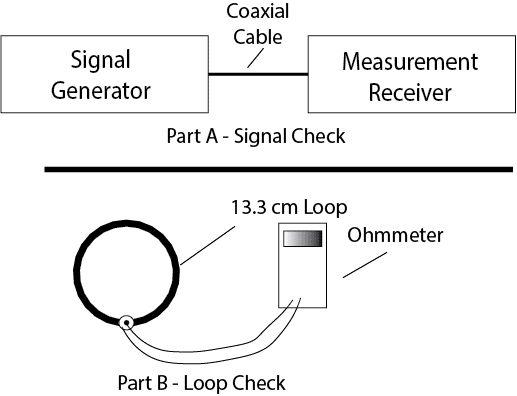 Assemble the signal source for measurement as shown in Figure 4 using the coaxial cable selected for EUT testing. 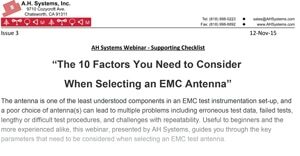 Include attenuators, filter or pre-amplifiers as required for testing. The rod antenna amplifier section is connected to the coaxial cable by a calibrator providing termination and capacitive coupling to the antenna input replacing the rod portion of the antenna. Refer to MIL-STD-461G for more detail on the rod calibrator configuration. Other antennae are not included in the signal integrity check. Set the signal generator frequency to 10 kHz (2 MHz if test range is not below 2 MHz).and amplitude to the limit minus 6 dB minus the antenna conversion factor. The antenna is not present for this signal check, but the measurement system will include the factor as part of the data reduction. Operate the measurement receiver to capture the signal and verify that the measurement is 6 dB below the limit (±3 dB). Repeat the checks for the specified check frequencies. Repeat the check for each measurement path configuration change such as addition or removal of a filter or other element of the path. Note that during the check the passive antennae were not present. A physical inspection of each antenna should be accomplished and repaired if found damaged. After a repair, the antenna should be calibrated. Using a stub radiatorNote 2, radiate a signal in the reception band for each antenna to confirm that the antenna is receiving the radiated signal. Note that accurate measurement of the stub radiation is not required but if the stub radiator and receiving antenna are consistently placed, measurements should be very close from one test to another. Note 2: Stub radiator is typically a coaxial cable with the outer braid removed on one end that will act like a monopole antenna providing a radiated signal to check the measurement system antenna for function. Once all measurement path and antennae have been checked you are ready to establish the test configuration as shown in Figure 5. The antenna replaced the signal generator used in the integrity check. The antenna is positioned 1-meter from the test boundary. The test boundary is the area that encompasses the EUT, cables, and LISNs – not the ground plane. If the cables are 10 cm from the ground plane front edge, then the antenna is 0.9-meter from the ground plane. The rod and biconical antennae are normally located near the center of the test boundary. The doubled ridge horn antenna is positioned so that the EUT plus 35 cm of cable is within the antenna beam-width for the 200 MHz to 1 GHz range. The double ridge horn for the 1 GHz to 18 GHz antenna is positioned to place the EUT plus 7 cm of cable in the antenna beam-width. For large test articles, multiple antenna positions may be necessary to examine the EUT. Horizontal and vertical antenna polarizations present different beam-widths so one polarization may require more positions than the other polarization. The standard indicates that testing should be accomplished on the EUT face with maximum emissions. Prior to test, a probing process may be used to look at all faces to determine worst-case orientations. Frequently, the cable interface side is worst at lower frequencies and an operator display face or open panels are worse at higher frequencies. Testing of more than one face may be necessary. Establish operation of the EUT and operate the measurement receiver system to collect and record emission measurements. Normally a separate chart is provided for each antenna, each antenna polarization, and each antenna position. The RE testing is not difficult, but there are many items that can cause flawed data. Consider the results and ask yourself “does this data make sense” and if you doubt the validity, examine for mistakes or simply redo things in question. At an antenna change point, the emissions should not suddenly disappear. A bandwidth change should see a noise floor change and a broadband signal would change by 20 dB for a decade of bandwidth change.